Regan Flay is on the cusp of achieving her control-freak mother's "plan" for high school success?cheerleading, student council, the Honor Society--until her life gets turned horribly, horribly upside down. Every bitchy text. Every bitchy email. Every lie, manipulation, and insult she's ever said have been printed out and taped to all the lockers in school. 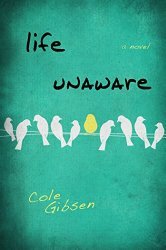 I have to preface this review by saying that the only reason I picked LIFE UNAWARE up was because I "met" the author at a Facebook party celebrating its release. When she talked about her own experiences with bullies I was intrigued to see what it had inspired. To my great pleasure the book was very good. Regan is certainly not the meanest mean girl I've read getting one-upped in fiction but I honestly don't think the romantic plot would have worked had she been. That noted, no one should be bullied and LU peels back the layers on each character in ways that make for interesting character development. If you're not brought to feeling compassion for even the nastiest of Regan's peers I'll be surprised. Nolan is important both as an ally in Regan's recovery and later as a love interest. He has secrets that really ramp up the plot. It's really hard to elaborate on LU without giving spoilers and even though I had the major plot points pegged they were still enjoyable. If you've ever been bullied or had a friend or family member who experienced it you're sure to find the big reveal toward the end as lovely as I did. I really wish they would make a movie out of this book and that's saying something. This book sounds fantastic! Might even let my dd read it. I was horribly bullied in school.